The Sackler Gallery’s exhibit Nomads and Networks: The Ancient Art and Culture of Kazakhstan shows the cultural complexity of inhabitants of the Eurasian steppe about 2500 years ago. These peoples are commonly envisioned as pastoral nomads and horse-mounted warriors roaming across the steppe. The entrance to the exhibit highlights poignantly a bronze tray upon which a lone man, seated cross-legged, seems to be fixed in eye-nose communication with a bridled horse. He has a straight-backed, proud posture. At the same time, from waist up his body is pitched forward slightly toward the horse. He holds a cup ambiguously for himself or for the horse. Eurasian pastoral nomads were not just horse people. The Begash culture of southeastern Kazakhstan was herding sheep and goats about 4500 years ago. The Begash had domesticated horses from at least 4000 years ago. Yet they had few horses. Measured by animals remains found, the share of horses in their livestock remained below 6% until about 1950 years ago. Horses were not a prominent feature of the early Begash pastoral lifestyle. 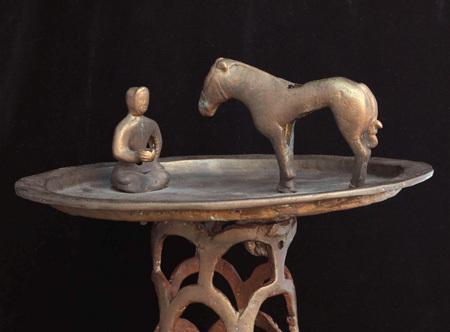 The bronze tray is not just a man communing with a horse. The horse has a hole in its back. The cup that the man is holding has no bottom. Rods with some other assemblages seemed to have been attached to the horse and to the man’s cup. Other similar bronze trays on display apparently were made within a culture of complex symbols and abstract ideas. For example, another tray has at its center a fallen ibex with open eyes. Two wolves arranged nearly face-to-face eat the ibex. At a right angle to the line of wolves are a line of two ravens, watching. Circling the whole scene along the circumference of the tray are sixteen snow leopards. Another tray has four winged felines also in linear-perpendicular arrangement. Given these obviously related artifacts, the man communing with the horse apparently was much more culturally complex than just a representation of affection and mutual dependence between human and horse. Nomads and Networks exhibits ancient Kazakh culture with thought-provoking subtlety. The second room of the exhibit features artifacts from a kurgan (burial mound) in Berel in eastern Kazakhstan. Buried within that kurgan was a 40-year-old man, the man’s 65-year-old mother, and thirteen horses. The horses were buried wearing lavish, intricate horse tack. That tack included a headdress giving the horses large, carved-wood, gold-plated ibex horns. This was a horse culture with a death vision of the horse transformed into a bejeweled ibex. Mobile pastoralists in the Eurasian steppe 2500 years ago connected the Achaemenid Persian Empire to the Chinese Wusun people. The third room of the exhibition shows the exquisite gold Kargaly diadem that includes Wusun dragon motifs. A monumental bronze cauldron-adornment features a pair of winged ibexes with upward-bent s-shaped wings. These are similar to figures found at the Achaeminid capital Persepolis. Most immediately impressive are massive bronze caldrons, each with three, jointed legs pitching them at a slight angle. One cauldron has on its upper leg sections figures of tigers holding in their mouths the lower legs. These do not seem like cauldrons made for washing clothes and cooking soup. They appear to have symbolic-communicative ritual motivation like that of ancient Chinese bronzes. Mobile pastoralists of the Eurasian steppe experienced a remote, majestic natural world. But they did not live only in that idyllic world. They were also connected to the mainstream of ancient civilizations’ technological and cultural developments. Nomads and Networks: The Ancient Art and Culture of Kazakhstan is a superb exhibit well-worth making a special effort to see. The artifacts on display are rarely seen outside of Kazakhstan. The exhibit, which consists of only three small rooms, opens new vistas of understanding as large as the central Eurasian steppe. The exhibition is on display at the Smithsonian’s Arthur M. Sackler Gallery through November 12, 2012. A book also entitled Nomads and Networks contains the exhibit catalog and related scholarly essays. Frachetti & Benecke (2009) p. 1031. Dienekes’ Anthropology Blog has related discussion. Three-legged stone altars on display similarly have wolf-head legs. The diverse regional innovations, technologies, and ideologies evident across Eurasia in the mid-third millennium BC are cast as the building blocks of a unique political economy shaped by “nonuniform” institutional alignments among steppe populations throughout the second millennium BC. This theoretical model illustrates how regional channels of interaction between distinct societies positioned Eurasian mobile pastoralists as key players in wide-scale institutional developments among traditionally conceived “core” civilizations while also enabling them to remain strategically independent and small-scale in terms of their own sociopolitical organization. The development of nonuniform institutional complexity among Eurasian pastoralists demonstrates a unique political and economic structure applicable to societies whose variable political and territorial scales are inconsistent with commonly understood evolutionary or corporate sociopolitical typologies such as chiefdoms, states, or empires. This sort of institutional development seems quite similar to that associated with the Internet. [photo] © The Central State Museum of the Republic of Kazakhstan, Almaty. Courtesy of the Sackler Gallery press office. Frachetti, Michael D. 2012. “Multiregional emergence of mobile pastoralism and nonuniform institutional complexity across Eurasia.” Current Anthropology. 53 (1): 2-38. Frachetti, Michael, and Benecke, Norbert. 2009. “From sheep to (some) horses: 4500 years of herd structure at the pastoralist settlement of Begash (south-eastern Kazakhstan).” Antiquity. 83 (322): 1023-1037.